Mindy Solkin is founder of The Running Center, an in-person and online running coaching, fitness training, and wellness business, which she created in New York City in 1999. Born and raised in Philadelphia, she spent over 20 years in Manhattan, where she coached and trained 12,000 people ― from beginners taking their first step into a healthy lifestyle ― to experienced athletes looking for the next edge. She is a USA Track & Field, Level 2, professional, certified running coach since 1998, and a WITS certified personal trainer. She was certified by ACE as a personal trainer from 1994 to 2014. She has left her coaching stamp on health clubs in NYC, creating the running programs at Reebok Sports Club/NY (now an Equinox club) and New York Sports Clubs. 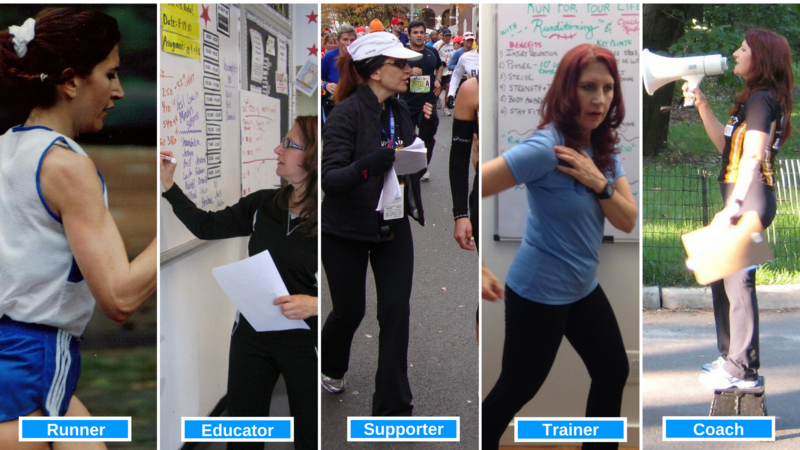 For over 20 years, Coach Mindy trained thousands of runners for the NYC Marathon. This included her extremely popular "Last 10 Mile Run" and "20-mile training runs", to help runners prepare for the infamous 26.2 mile journey through the streets of the five boros of New York City. She was also a member of the marathon's medical staff for 11 years. In 2017, she returned to her hometown of Philly, bringing a wealth of knowledge and experience to the City of Brotherly Love and Sisterly Affection. She is pleased to be collaborating with Optimal Sport Health Clubs in Center City, Philadelphia, where she'll be hosting many of her programs, services, and classes. Her innovative programs for groups and individuals combine a keen understanding of The Art of Coaching and The Science of Training. "Coaching is the ART of inspiring people to maximize their potential and lead a healthy lifestyle." "Training is the SCIENCE to help people improve their performance and prevent injuries." As a former fashion designer, she discovered her love of fitness and running after attending running camp, then set her sights on a career change. After realizing that she was a gifted runner, she became a competitive runner and frequent age-group award winner from distances of 5K to the half-marathon. Additionally, she has run six marathons including being qualified to run in the prestigious Boston Marathon, and has competed in countless races, placing in the top 5% to 10% of the field. Wearing many hats throughout her career, she created the Polar Heart Bra, a sports bra that secures the heart rate monitor into place. She was a PowerBar Team Elite sponsored athlete from 1995-2016 and was also featured on the label of Owater Sports Water. Her altruistic personality led to the creation of the Leukemia-Lymphoma Society's Team In Training (TNT) marathon program in NYC, where she served as head coach and marathon consultant from 1994 to 2001. She successfully trained over 3,000 runners and walkers to participate in marathons in dozens of cities across the globe. Collectively, through her coaching efforts, they raised over $8-million dollars for the Society. Much of what you see today in the TNT program and other charity running programs, is a direct result of her pioneering leadership. Coach Mindy has written for and been featured in dozens of online and print publications including Fitness, Shape, Self, Runner’s World, Women’s Running, New York Runner, NY Times, and NY Daily News. She has appeared on local and national television shows including CNN, Access Hollywood, CBS-2 News This Morning, 20/20, Today In New York, and Good Day New York. She is a sought-after guest speaker and clinician for numerous business and community events, and has created a multitude of projects including workshops, videos, and podcasts. Read about these accomplishments on her LinkedIn page. Her passion for fitness, wellness, and the sport of running, and her compassion for the people who she coaches, is what truly make her a special coach. But more importantly, she’ll make YOU feel special.